Both teams did it! They got the maximum amount of touchdowns for the Touchdowns and TACORI offer! What does that mean to you? 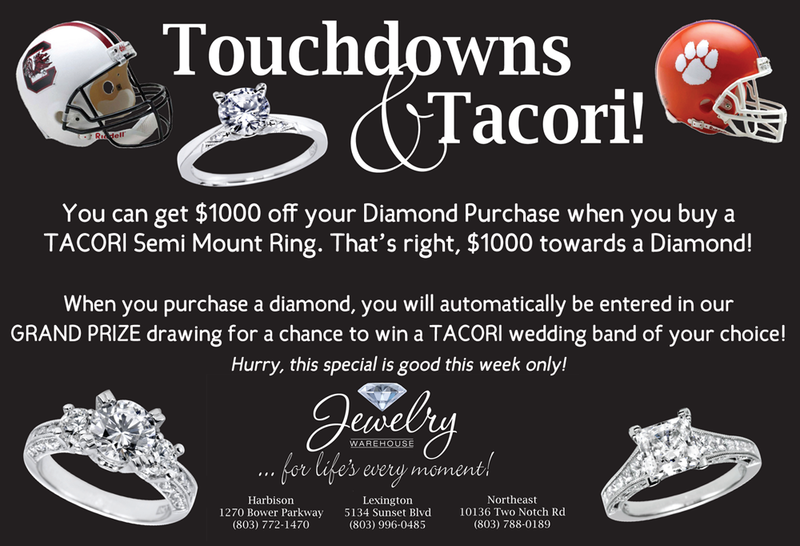 It means that you can get $1000 off the purchase of your Diamond, when you purchase a TACORI Semi Mount Ring. The $1000 offer is good towards the Diamond only, not the Tacori semi mount ring. Also, when you purchase a diamond and a TACORI setting from us, you will also be automatically entered into our GRAND PRIZE drawing for a chance to WIN a TACORI wedding band of your choice! So if you are looking at engagement rings, now is the perfect time to purchase one and get $1000 OFF the diamond. TACORI is the most desired Bridal Jewelry Line out there! Each TACORI piece is hand crafted in California and their exquisite attention to detail is what sets them apart from the rest. Offer good through October 12, 2013. This entry was posted in Diamonds, Jewelry and tagged diamond, diamond jewelry, diamonds, jewelry warehouse, tacori, tacori jewelry. Bookmark the permalink.